Samsung Electronics’ heir apparent Lee Jae-yong departed for India on Sunday with two major tasks: recover relations with the Moon Jae-in government and lay groundwork to further expand in the Indian smartphone market. The highlight of Lee’s trip to India will be his meeting with President Moon -- who also left Sunday for a state visit to the country and Singapore for six days. They will be face to face at a ceremony on Monday to mark the completion of Samsung’s newest factory for smartphones in Noida, a planned city in the northern state of Uttar Pradesh. The meeting between Lee and Moon will be the first since Moon took office in May 2016 and Lee was released in February after serving a jail term for his role in the corruption scandal involving former President Park Geun-hye. Some industry observers raise expectations that the Moon-Lee meeting will be a signal for a change in the current government’s stance on Samsung and other conglomerates that have been deemed as part of the so-called “accumulated evils” of the past, which attributed to the oust of the former president and the collapse of the country’s conservatives. Samsung, in particular, could expect the upcoming meeting with the president to serve as an opportunity to recover soured relations with the government, some industry officials say. The biggest South Korean family-run conglomerate has been suffering pressures from various government agencies including the Fair Trade Commission and the Financial Services Commissions on issues and suspicions regarding inheritance of the management leadership from Samsung Chairman Lee Kun-hee to the heir, false financial accounts under the name of Chairman Lee, window dressing settlement for Samsung Biologics, and Samsung Life Insurance’s stake ownership in Samsung Electronics. Although officials at Cheong Wa Dae strongly denied any change in the government’s stance towards the business community and cautioned against an exaggeration of the Moon – Lee meeting, industry officials say the president’s visit to the new Samsung plant in India would help improve the relations. 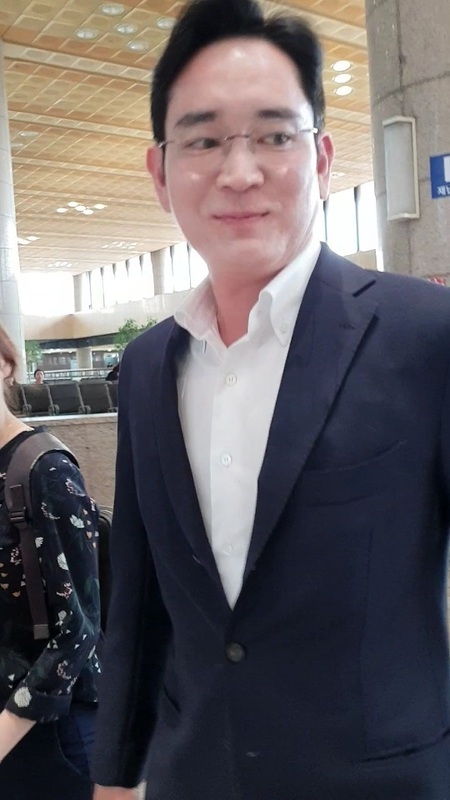 Samsung heir Lee didn’t make any comment on the planned meeting with Moon in an encounter with The Korea Herald at Gimpo International Airport right before his departure on Sunday morning. Lee was accompanied by Vice Chairman Yoon Boo-keun and Mobile Business CEO Koh Dong-jin. Another task for the Samsung heir in the latest India trip is to seek breakthroughs for its smartphone business that is gradually losing steam. According to IHS Markit, Samsung yielded to China’s Xiaomi in terms of market share in India for the October – December period in 2017. As to the question of the poorest performance in the Indian smartphone market in the fourth quarter of last year, Koh said it was largely due to seasonal effects. With the new $650 million Noida plant slated for operations in the second half of the year, Samsung is planning to ramp up its smartphone production from the current 5 million to 10 million units in a bid to boost sales there. Samsung is also making India a strategic foothold for its expansion into the global mobile network market. Fallen behind of major global network equipment providers -- Huawei, Ericsson, Nokia and ZTE -- Samsung is establishing nationwide LTE network infrastructure in partnership with the nation’s leading mobile carrier Reliance Jio, and aims to preoccupy the market for 5G in the future. Samsung’s Network Business President Kim Young-ki has vowed to double its network business in the 5G era. Kim is also said to join the presidential meeting in India. “The company’s mobile business division is being reshaped centering the network business by dispatching around combined 200 junior-level engineers who used to develop smartphone hardware and software to the network equipment unit,” said a Samsung official.